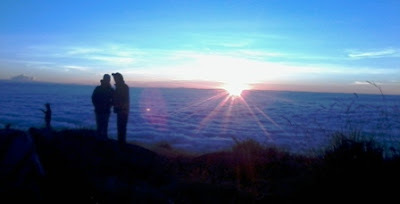 A 2 days /1night guided trekking trip for volcano Merbabu, lead you hike until peak Pregodalem at elevation 3119 m ASL which is today more popularly called by hiker - trekkers - climbers as peak Syarif. The peak it self is considered as best point for catching moment of sunrise at Merbabu, and admire morning stunning view of surrounding volcanic cones such lower cones Unggaran,Telemoyo,and Andong, while in far distance east is cone of volcano Lawu under ray of sunrise, and in west are volcanoes Sindoro-Sumbing towering breakthrough morning mist, at another side is closer view of volcano Merapi . The highland of volcano Merbabu is under management of national park system, so it is protected area to conserve the habitat of mountain flora - fauna. It has vital role as water catchment zone for lower surrounding area. During on hiking, you can expect to experience tranquillity of tropical mountain forest Merbabu, get good view of green valley plus waterfall, also get closer look of uniqueness of old crater Merbabu. This guided volcano trekking program is physically moderate, enjoyable by those has passion for mountain environment and fit to do 4-5 hours actual hiking per day. Leave Yogyakarta in the morning 08:00 am for Merbabu trekking basecamp at Wekas Kedakan on elevation +- 1752 m ASL, hike through cobbled road of village, path of tropical mountain forest and more rocky path of sub alpine vegetation head for knoll at elevation +- 2775 m ASL of Merbabu. Overnight by tent. Actual drive approx 2,5 hours. Normal actual hike approx 4 hours of ascent. Summit push for peak Syarif / Pregodalem on elevation +-3119 m ASL through crux of more exposed Merbabu edge in early morning to arrive on peak in sunrise. After summiting, hike down back to trekking basecamp of Wekas Kedakan to transfer back to Yogyakarta. Actual drive approx 2,5 hours. Normal actual hike approx 5 hours of ascent and descent.